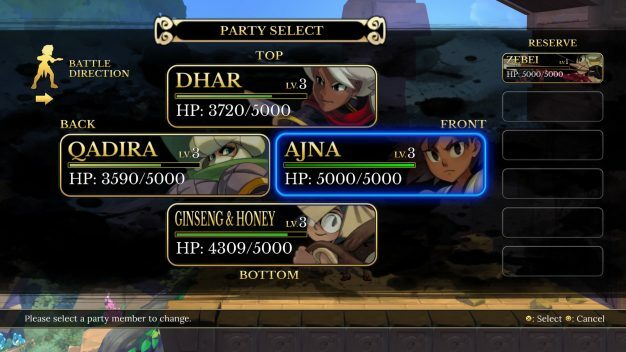 Indivisible is the newest, completely crowdfunded game from Lab Zero, the makers of Skullgirls. The gorgeously hand-drawn game tells the tale of good-natured, rebellious tomboy Ajna, whose life is tipped upside-down when her town is attacked. This awakens a mysterious power inside her – the ability to absorb certain individuals into her being. 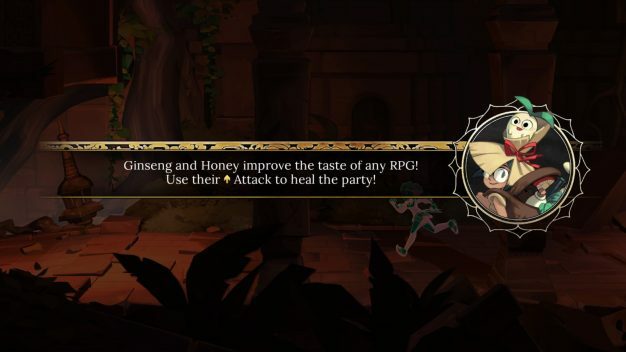 This is information I received from official sources, because the copy of Indivisible we received is a backer demo that throws you straight into the action without any context. This is fine, obviously, because if you’ve been backing the game then you likely have an idea of what you were getting into and don’t need that context. 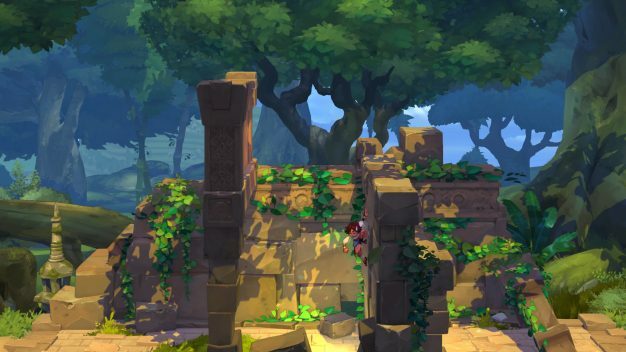 So you’re thrown straight into controlling Ajna in a pretty, green location with lots of ruinous structures to climb. The main aim of the demo is to chase after your little creature friend who will occasionally appear and then dash ahead and out of sight, and to fight things while collecting other party members. 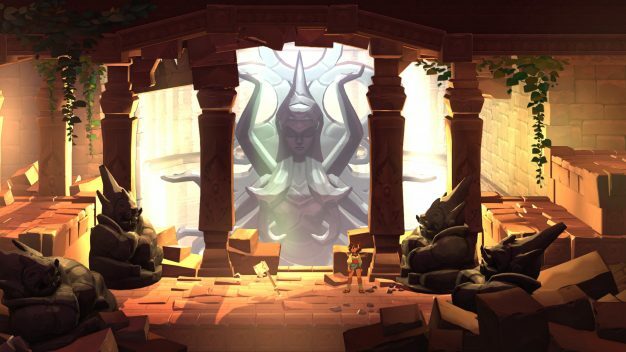 Controlling Ajna feels quick and responsive, and the parkour and wall-climbing mechanics are similar to that of games like Hollow Knight (which I have viewed but not played, for what it’s worth). It takes a little getting used to, but once you get the hang of it, it’s a breeze to traverse the various locales in the demo. Voices and music are fairly limited and at this stage. I’d say they’re appropriate but unremarkable, though that may change with the full release of the game. I really liked the variety of party members you could pick up, ranging from a weedy archer to a lady tank to a kid with a weird pet and magic potions. The battle system is strongly reminiscent of Valkyrie Profile 2: Sylmeria, in that each of your four party members is linked to one of the four buttons on the D-pad, and over the course of the demo they are able to attack more times per turn (indicated by the number of filled circles below the character on the battle screen). For the uninitiated this leads to a lot of fun button mashing, but just like with Valkyrie Profile, those who learn the intricacies of the battle system will be able chain together impressive combos and absolutely mince enemies. I found the battle system to be the right balance of challenge and fun, and while the demo didn’t have much in the way of actual story, the background art and monster and character designs are cute and pretty. It’s fun to just get around the map in Indivisible, and based what I’ve seen on their official website, the rest of the environments are absolutely gorgeous and overwhelmingly creative. After the final boss of the demo, you get to see a little hint at Ajna’s special power before it cuts to black. 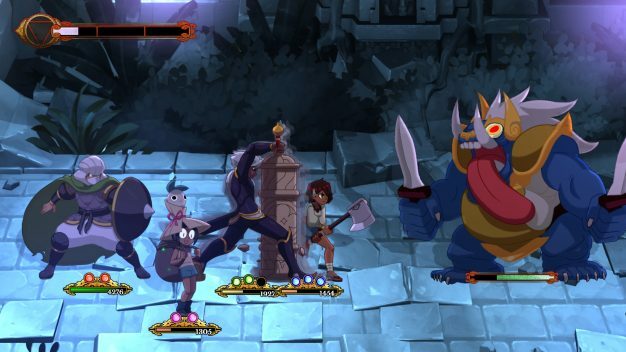 Indivisible is a beautifully crafted platforming RPG with a fun yet challenging battle system. I for one will be highly anticipating the full release. It’s sure to be an extremely fun, fast-paced game with wonderful places to explore. This preview is based on a backer demo provided by the publisher.